The Micronic externally threaded 3.00ml tube provides an ideal and fully traceable storage solution for fresh frozen tissue samples with a size of 0.5cm3 to 1.0cm3. 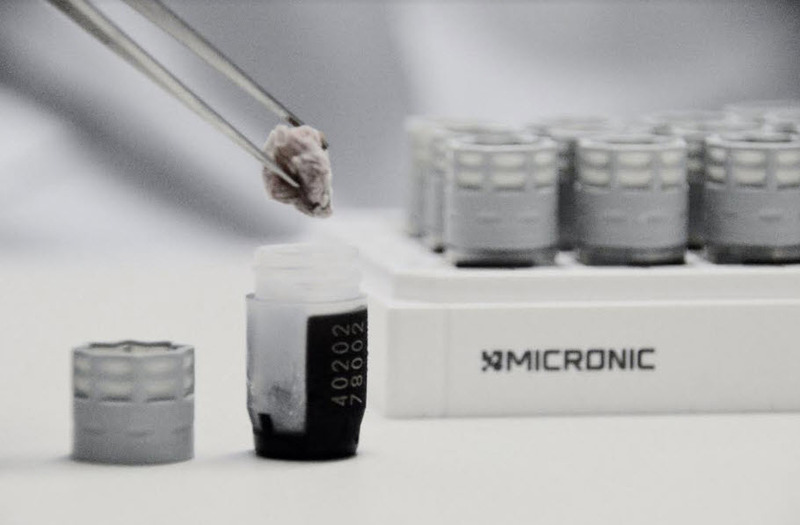 Micronic 3.00ml tissue tubes offer easy and unambiguous identification and storage of fresh frozen tissue samples. The tubes have a unique 2D Data-Matrix code laser encrypted on the tube bottom and a large human readable code on the tube sidewall. The unique 2D code identifies the sample. Scanning the Micronic 24-2 storage rack will also identify the tube sample code with the location in the rack. For highly accurate and reliable results, the Micronic 3.00ml tissue tubes are produced from medical-grade polypropylene. The 3.00ml tubes have a wide shallow opening enabling easy loading / removal of tissue samples using tweezers. They are also designed to be the ideal shape for gripping with a robotic arm, thereby enabling simple integration into a high throughput environment. Produced using a double injection moulding process, each Micronic 3.00ml tissue tube has a black code surface that cannot be separated from the tube. A transparent sidewall enables easy visual checking of the enclosed tissue sample. To ensure high sample integrity, even down to vapour phase liquid nitrogen temperatures, the 3.00ml tissue tube includes a novel 'single turn' TPE / polypropylene screw cap that stays securely in place even during repeated freeze / thaw cycles. To aid easy visual differentiation of stored samples, the inner TPE element of the externally threaded screw cap is available in 6 different colours. In addition to storing tissue samples in biorepositories and biobanks, the flat bottomed 3.00ml tube can also be used for secure transportation of other solid biological samples.